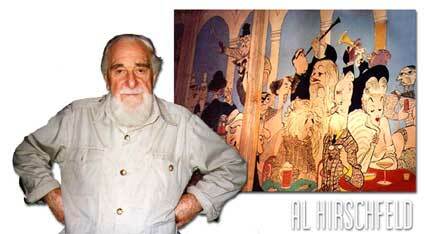 Al Hirschfeld (1903-2003) was a family friend since before I was born and I have been fortunate enough to have enjoyed conversations and dinners with him and (his then wife) Dolly many times especially when I was living in N.Y.C. and struggling to make ends meet. He was the most unique artist I knew . There are many artists who attempt to draw caricatures of famous people but pale in comparison to his wonderful and energetic style. He was funny, warm and entirely real which is amazing to find in someone who has dealt with famous people all his life. He lived in the same apartment in New York City since time began and although well into his 90's had remarried after the passing of Dolly. I will never forget his advice to me when in his concern for my well being gave me a bit of advice: "If you really want to succeed in New York City, open a delicatessen - people always need to eat..." Well, I never took his advice and perhaps that is why I'm not a wealthy girl by now but I'll never forget his kindness. The picture behind him is a mural that I came across in an old Hollywood bar . I took a photograph of it knowing that someone had admired Al Hirschfeld enough to meticulously recreate his work. It was yellowed from years of smoke and heat, slightly damaged still I had the feeling I was back in the days when stars really did walk down Hollywood Blvd.